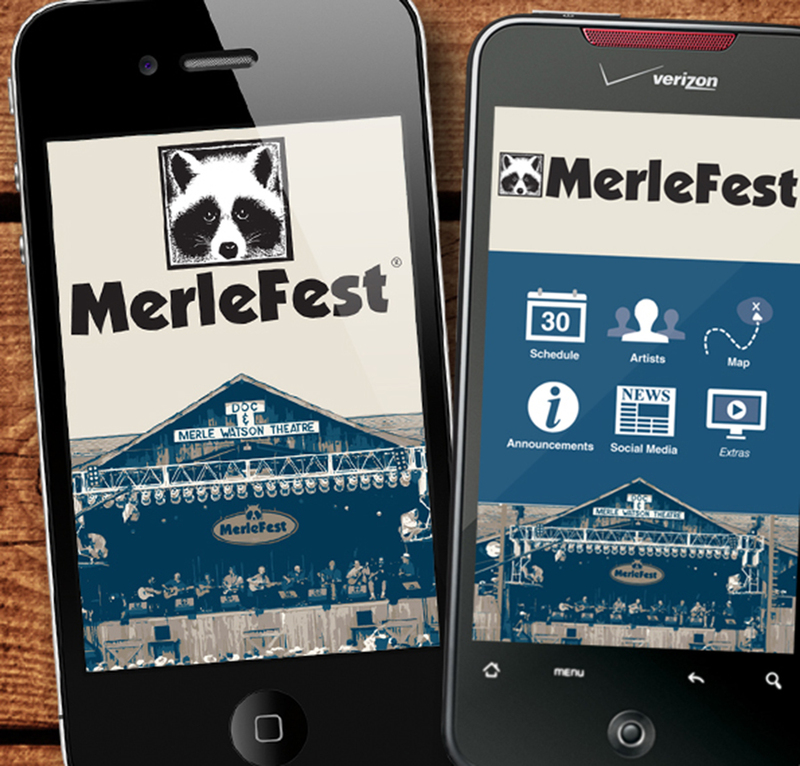 With the introduction of a free new mobile app, MerleFest, presented by Lowe’s, just got even easier to plan! The MerleFest mobile app is available for download through a link, available at www.merlefest.org, that goes directly to the app store. The app, being offered at no charge to users, will provide the MerleFest lineup and schedule, artist biographies, map, announcements, social media links and more. The app is compatible with Android and iOS platforms. The MerleFest app was designed especially for the four-day event, an annual homecoming of musicians and music fans that will once again take place on the campus of Wilkes Community College in Wilkesboro, North Carolina. A bonus for MerleFest fans: once downloaded, the app will be fully functional without having connection to phone service. Fans can even plan their festival meals in advance. On the MerleFest website – in the “Vendor” section under “food menus” – music fans can preview their many food options onsite! Additionally, there are Wi-Fi hotspots around the campus and inside the buildings that are open during MerleFest. 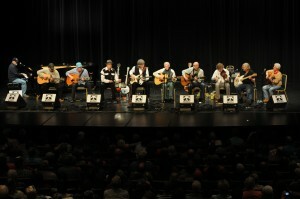 Tickets for MerleFest can be purchased at www.merlefest.org or by calling 1-800-343-7857. Additional details about this year’s festival lineup and other MerleFest information can also be found at the website. Saturday evening all-star tribute among the many ways that the 2013 festival celebrated the life and music of the late Doc Watson. When MerleFest, presented by Lowe’s on April 25-28, 2013, kicked off, it was a bittersweet moment. The four-day event, an annual homecoming of musicians and music fans, once again took place on the campus of Wilkes Community College in Wilkesboro, North Carolina. But for the first time in its 26 years, MerleFest took place without beloved music icon Doc Watson, who passed away on May 29, 2012. • A new display was introduced in Lowe’s Hall with a bust of Doc and memorabilia of his life and career. • A student emergency fund in Doc Watson’s honor was announced at Wilkes Community College. This fund will be used for student emergency needs, to allow students to continue their education. 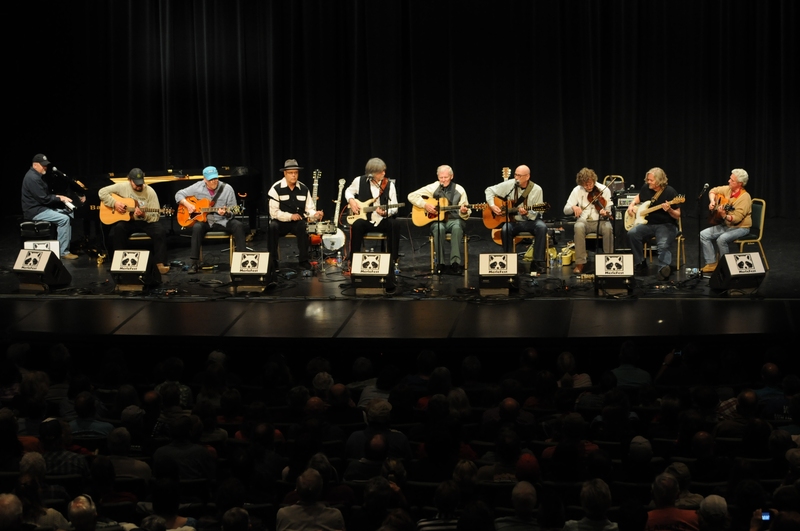 The “My Friend Merle” set at MerleFest 25 featured (left to right) Jeff Little, Richard Watson, Bob Hill, David Holt, T. Michael Coleman, Doc Watson, Mitch Greenhill, Sam Bush, John Cowan and Joe Smother.